Welcome to Saugeen Shores & my information web site, where your dream home could become reality. I will assist buyers and sellers with any and all of their real estate needs. This site was designed in order to better educate and inform buyers and sellers through comprehensive information as a FREE no-obligation service. Many buyers & sellers who visit this site are so impressed with this service that they will contact me to assist them in their purchase or sale of their home. There has never been a better time to check out Southampton Real Estate, Sauble Beach Real Estate and Port Elgin Ontario than right now. There are currently great deals on Southampton beach front homes and vacation homes, commercial properties and Grey & Bruce County farm properties. Having myself as a professional real estate agent working for you will give you access to exclusive listings and deals that will make your next real estate transaction a great one. I am a full time broker of record with my new franchise, Sutton-Huron Shores Realty Inc. 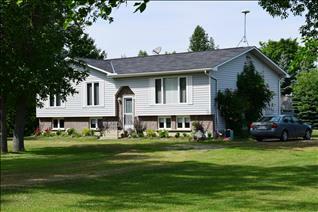 Brokerage & have been a resident in Saugeen Shores for over 50 years. My motivation to my clients & friends in the business of buying & selling real estate is very important to me & I approach each transaction with professional, friendly and results oriented service. Whether you are a first time home buyer or needing to sell your current residence for a larger or smaller home, I will be there for every step of the process. I work to be the agent you respect enough to refer to your friends and family. Thank you for visiting my website. I represent some of the finest properties in Port Elgin and Southampton Ontario, from century homes, new homes, vacant property to beach front vacation homes. I pride myself on providing my clients exposure in the benefits of today’s real estate market while protecting them from bad investments and overvalued properties. Call Brian Shular, Broker today to view our exclusive listings and great financing deals. I have the perfect house for you to call home! greybrucerealestateinfo.com delivers FREE Expert Real Estate Information to the Buyers & Sellers of Southampton, Port Elgin, Saugeen Shores, Owen Sound, Tara, Paisley, Tiverton, Saugeen Township and surrounding areas.